This is post isn’t about an app for the iPhone, rather a nice video I saw that covers tips for better Depth of Field photography. I have covered a few apps where you can add the effect to a photo on your iPhone after you have taken the photo (eg. AfterFocus). You can still use those apps or use the focus ability of many iPhone camera apps (like ProCamera), there is more involved than just grabbing a photo and blurring out everything but your key object. 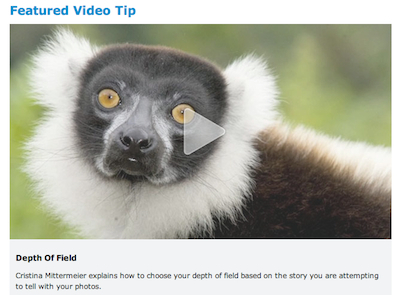 The video, Depth of Field by Cristina Mittermeier is about framing an image to tell a story. This can apply to taking the photo with your iPhone perfect when you hit the shutter button or later in your editing. The tips hold true whether your using a digital camera, a film camera or a iPhone. I’m not able to imbed the video here on this page, but you can jump over to Digital Photo Magazine and watch it there. Hope you find it as helpful as I did.